Hot on the heels of revealing the cover artwork for the upcoming sixth album Gold & Grey, Baroness have launched a video for their new single Borderlines. The follow-up to 2015’s Purple will launch on June 14 via Abraxan Hymns, with the record the latest in their colour-coded run of albums. Vocalist and guitarist John Baizley says: “Our goal is, was, and will always be to write increasingly superior, more honest and compelling songs – and to develop a more unique and challenging sound. Baizley adds: “I consider myself incredibly fortunate to know drummer Sebastian Thomson, bassist Nick Jost and guitarist Gina Gleason as both my bandmates and my friends. They have pushed me to become a better songwriter, musician and vocalist. She adds: “As we pushed past our fear and comfort zone, the four of us connected in a way that allowed us to create freely, uplift one another and build the unique sonic world that is Gold & Grey. “As a longtime Baroness listener, it is exciting to have created something new while still maintaining a deep love and understanding of the band’s roots. 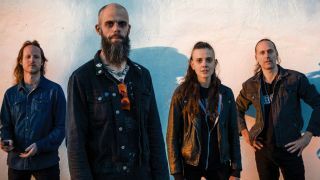 Baroness are currently on tour across the US with Deafheaven.